I get this question a lot from newbies, “How to add an admin user to WordPress?”, and I decided to write a post about it so I can refer them to it instead fo having to walk through the steps every time. Log into your WordPress first by going to YOUR-DOMAIN.com/wp-admin. This URL will take you to the admin login page, just remember to replace UOUR-DOMAIN.com with your actual domain. Then once you are logged in, put your mouse on Users button, in the left sidebar, and a submenu will pop up and click Add New on there, see image below for illustration of this step. Then just fill in the form (see image above). 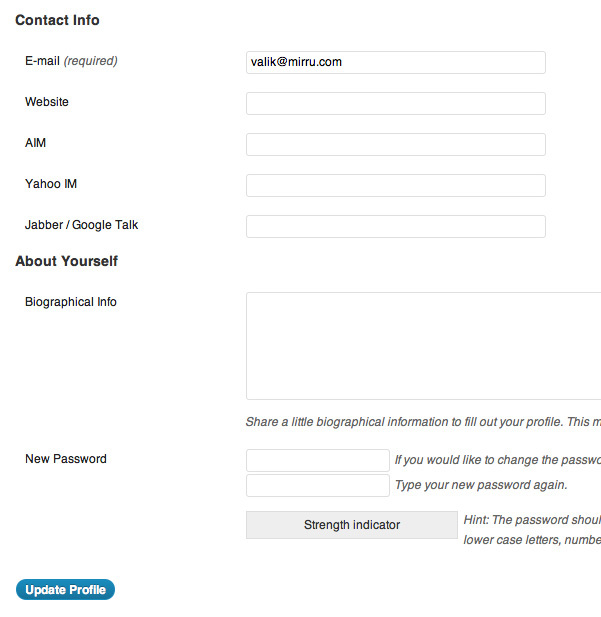 You can just fill in the required fields – Username, Email, Password and Role. 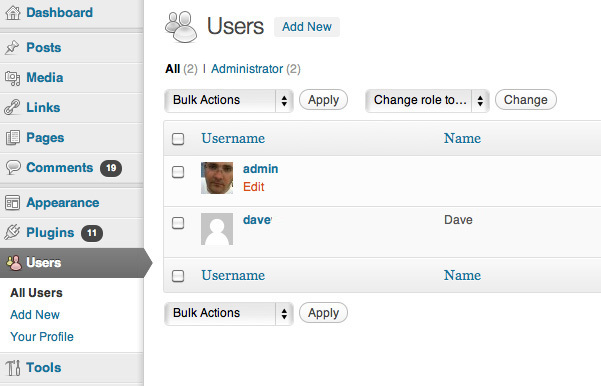 Role is important as this is how you select whether it is going to be an Administrator or a Subscriber user. You want to select Administrator in that drop down menu. Once done, click Add New User button and you are done. 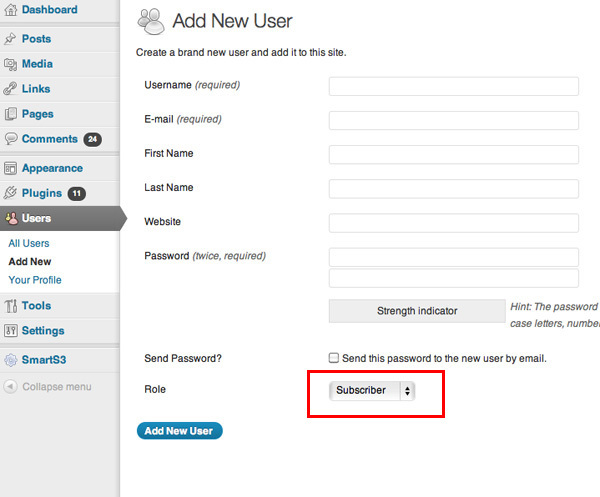 If you marked the “Send this password to the new user by email”, it will actually send the login info to the new user. While we are at it, let’s take a look at how to edit users too. 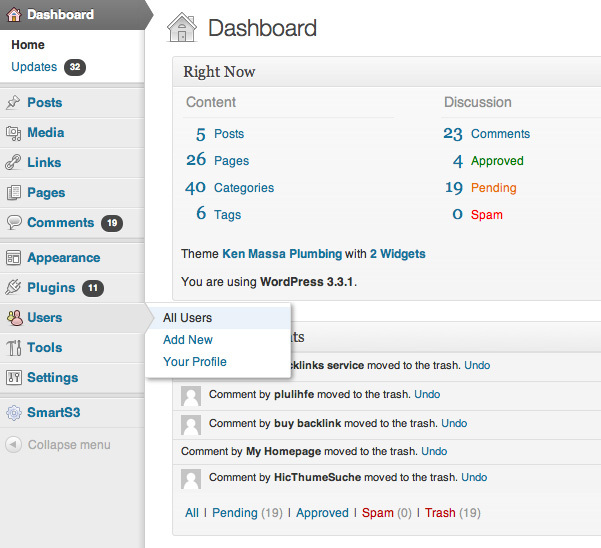 Once logged into WordPress, click the Users button in the left sidebar, or mouse over it and click All Users. User edit page: below is the page where you edit the user’s details. I will go through each option for you so you know what each of them does. The first one is Visual Editor and the option to disable it. This will disable the What-You-See-Is-What-You-Get (WYSIWYG) editor for this user when they write a post or a page. They will just have a text editor field without any kind of formatting buttons except a few basic ones. 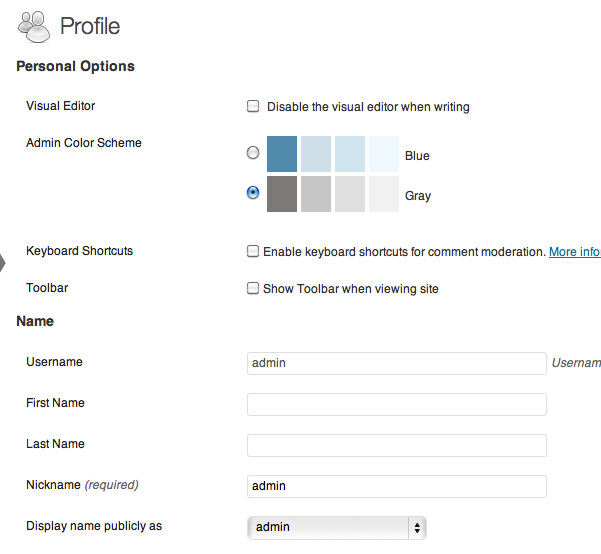 Then we have Admin Color Scheme, and this is where you change the colors of the admin area for this user. You can choose from a huge selection of blue or gray. Keyboard Shortcuts is when you can hit a key on your keyboard and it will run a command like delete a comment or something. You can read more about it here. In this new version of WordPress they added a Toolbar at the top that will display when you are logged in as admin and are on your live website. It shows up right at the top of your website. I personally do not like that and so I disable it here. Username is obviously the username of the user, First and Last Name also just first and last name. Nickname is what you want to be displayed next to the posts this user has added. 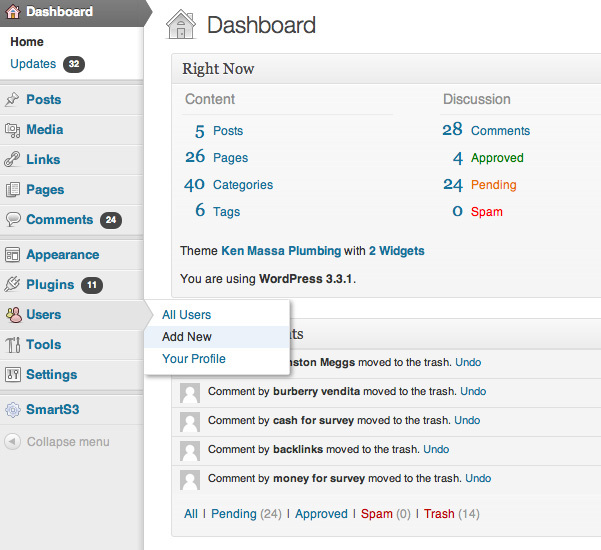 Display name publicly as will let you choose what name you want to display on the website as the author of the posts. You can choose from your real first name, real full name or nickname. Email is just as it says, so is the rest of the contact info, including the Biographical Info. This info will display in the About the author page if someone clicks on the name of the author that wrote a post. And lastly you have the Password. That will do it for this post. Hope it helped.